Problems - and price rises - caused by pre-printed albums. I can understand the appeal of pre-printed one-country albums with pictures of all the stamps, and mounts to hold the unmounted mint stamps. But I've never really liked the idea since I won a Sweden album in a Swedish Post Office competition, and found that there were pages for all the complete booklets as well as all the single stamps and pairs from those booklets. That meant I had two buy two booklets to be 'complete'. But I only collected used, so there was little chance of getting a complete booklet unless I bought it cancelled-to-order from their philatelic bureau. A complete run of stamps in a pre-printed album looks really good, and the pre-installed mounts do save a great deal of time - but at quite a cost. For some countries the pages for extra years cost more than the stamps they will hold. And the range of the collection is dictated by the album publisher, sometimes also a catalogue publisher. If the album has spaces for booklet panes as well as the single stamps, then you need two copies. To avoid being caught out you have to develop the skill to guess what the publisher will and will not include, because the new year pages are often published in late spring, which will be after some of its contents have gone off-sale at the philatelic bureau. I was reminded of this by two recent tips in the US Linn's Stamp News, in a column which alerts readers to fast-moving stamps. More often highlighting moves in US stamps the last two issues have mentioned the UK's 2009 Charles Darwin and 2010 Classic Album Covers issues, specifically the stamps with conventional gum from, the prestige stamp books. Because the 'over-the-counter' stamps were self-adhesive in both cases, the ones with 'water-activated' gum warrant separate catalogue listings, not just as complete booklets but as individual stamps and panes. In Stanley Gibbons' Concise catalogue for 2011 (published after the Album Covers had been taken off sale) these 10 are priced at a massive £24 - just 15 months after they were issued with an original face value of £3.90. 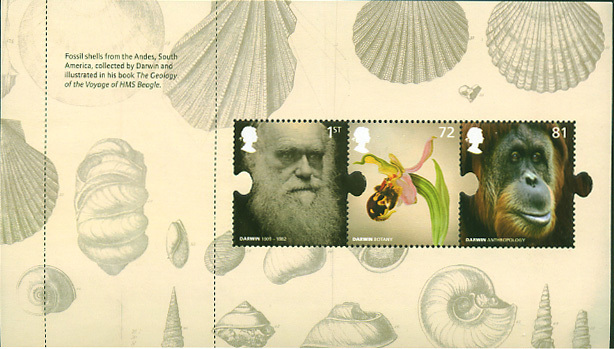 Similarly the 2009 Darwin set (face value £3.43) is listed at £26 mint and used. With increasing face values and number of issues, dealers are not holding large stocks of recent issues, and this - coupled with increased demand from owners of the latest album supplement - leads to increased prices. So be alert: anticipate what will be in the supplement while the stamps are still available. There are some that you just won't be able to get cheaper than original face value! You won't find them in discount postage boxes. GB Davo users were alerted to the need to obtain these panes when the 2010 supplement arrived. The Darwin was already "time expired" at the Bureau by then but the Classic Alums Booklet was not. As far as price rises go my money is on the Darwin. The question is, should SG have informed collectors & dealers that the full panes would be included in the pre-printed albums before the stamps became unobtainable at face? I wasn't aware that album producers gave such advice, it is good that they do. Not sure why SG should have to tell anybody anything - DAVO is not their product, but if you go by their catalogue - and the supplements in GSM - you would probably already know that they had given the gummed stamps independent catalogue numbers. This is true Ian for individual stamps and for the panes but which format would be included in the albums? Many collectors probably carefully detached the jigsaw perfed stamps & put then aside & then found out that they needed the pane! Not sure why SG should tell their customers anything? Customer service? Davo is not their product? true again but I've never seen a GB Davo which wasn't SG branded. Anyone who had prior knowledge of the format required for completion could make sure they had a good stock in hand. Perhaps I need to get out more. Sorry, I wasn't aware that the Davo albums had the SG brand on it. The last one I bought was Davo Denmark and it was purely and simply Davo. But I digress. Now bear with me, as I have never bought a pre-printed GB album, and my experience with other country albums led me to the realisation that there were far more (shades, for example) than the album ever catered for. Don't the GB albums have spaces for all PSB panes? If that is the case, then that is the default and people would keep the panes. I thought the point about the Darwin PSB was that the separate gummed STAMPS are listed with separate numbers and so a collector using a preprinted album needs an extra book for those stamps, and for any extras from the Machin pane. But he will then have the MS pane left over, because the stamps therefrom are NOT separately listed, being in the same format as the loose MS. The SG Davo's have never had spaces for complete PSB panes, that's how we were caught out. Stamps with perf. printer or gum variations eg, Submarines & RHS, were allocated single stamp spaces. Separating the jigsaw & disk stamps from their panes without damaging them is difficult & therefore labour intensive. This probably caused the decision to have spaces for full panes to be made. So if Royal Mail issue any daft shaped stamps in future, keep the pane until we know what's going on! Thank you for the clarification J. I agree with you that in this case SG could have been more proactive and advised collectors of the new policy. If you mean "in the 2011 album supplements", no I'm sorry I have not thought about that yet. I welcome suggestions, or contributions from people who already have any supplements. I believe the Windsor is out?